At a Friend's Meeting for worship, the couple and then all the witnesses sign the certificate. The couple sign as a pledge to each other to be faithful, honest and loving. 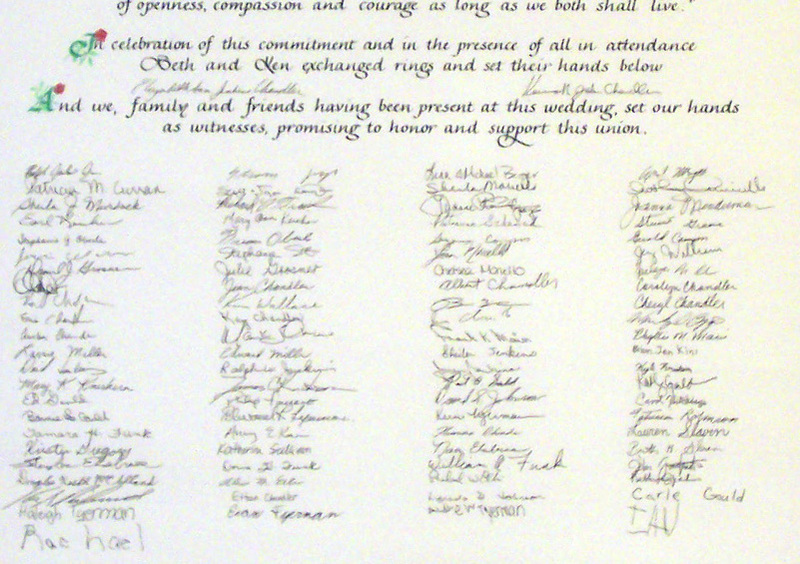 The witnesses sign to show their approval of the marriage and pledge their support to the couple. One very important detail to consider in designing the certificate is about how many people do you think will be signing your certificate. This is important to consider because a lot of signatures might require a larger sheet of paper. Our standard sheet is 22" x 30" and usually accommodates up to about 120 signatures. We have paper as large as 30" x 44" which can hold over 350 signatures. There is no extra cost here but we have to design for enough space. You may estimate at first and give us a closer number later. Drawing lines in pencil for the guest signatures is the last thing we do on your certificate. Couples should plan to have someone in charge of directing people how to sign the certificate. Have them sign the certificate across rather than down the first column. Guests tend to sign down the first column then start on the next column. If there are not enough guests that sign the certificate it could look like the example on the left. On the certificate to the right, guests were advised to sign across the top row first, then across the second row, and so on. It keeps the signature area looking more even. What kind of pen should I use? We send the pens you may use for signing. They are permanent black pens that are acid free and archival. The signatures will last as long as your certificate. Who should sign the certificate? 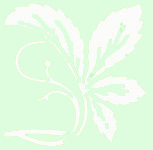 In general, everyone who attends the wedding may sign just as everyone signs a guest book. As the certificate is used by some couples in lieu of a guest book this is proper. In this case children as well as adults sign it. Some couples limit the signers to over a certain age. Taken as a legal document, however, the certificate could represent a contract in which the people who sign pledge whatever support is needed to the couple. In this more serious use, only persons "of age" should sign. The signing process usually involves each person in turn signing their own names. However, some couples may wish to sign "Mr. and Mrs. John Smith" The marriage couple may want to consider this and directing the certificate minder how they want people to sign. If you have other information about anything on this page we would like to hear from you. 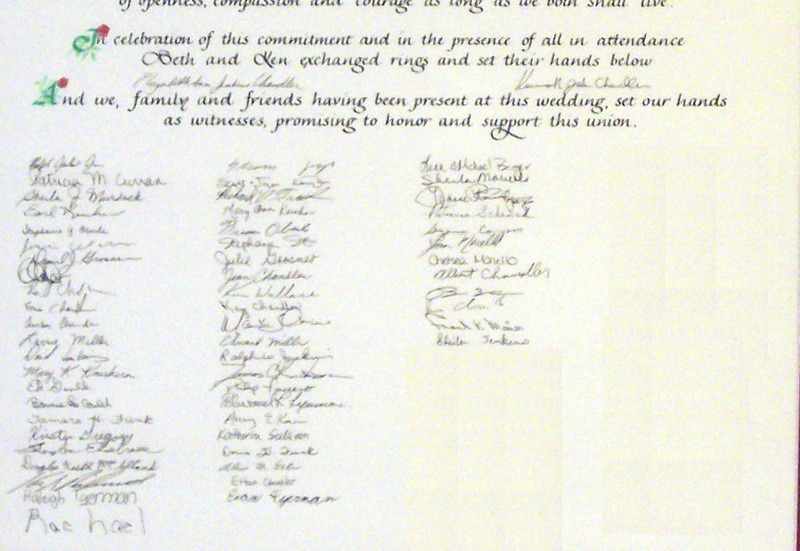 We have heard from a few couples that had their certificate "vandalized" while it was on display at the reception. One couple found that a couple of the children drew pictures in the signing area and only saw it afterwards. Another couple said one of their "adult" friends drew a cartoon in the signing area. They were not happy with him. The moral is, have one or two people watching the certificate all the time.